IN THIS SERIES, TheJournal.ie takes a look at an urban myth, old wives’ tale, or something that your mammy told you years ago to see if there’s any truth in it. The spread of a poisonous spider across the British Isles has grabbed the interest of many in recent weeks. The False Widow has been found in many locations across England, and has recently popped up more often in Ireland. Its bite has effects similar to that of a wasp sting. However, are we already living in peace with the deadliest spider in the world, the Daddy Longlegs? And are we in fact surrounded by all sorts of venomous spiders without realising it? 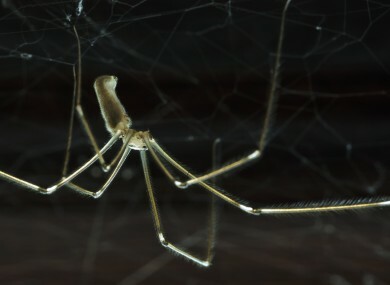 An old wives tales has led many to believe that the Daddy Longlegs is the most, or one of the most, venomous spiders in the world, but due to an evolutionary quirk they don’t have the fangs necessary to bite. A variation on this says that they have the fangs, but they’re just not quite strong enough to pierce human skin. Firstly, it’s important to note what we’re talking about here, as a few creepy-crawlies are called Daddy Longlegs. The one in question is generally not a Crane Fly or Harvestman spider, but a cellar spider (Pholcus phalangioides), pictured below. The Crane Fly can be instantly dismissed from this as the adult of species does not eat; they exist only to mate. The Harvestman is not technically a spider and doesn’t have fangs, although they do have the ability to produce a very weak “defensive secretion”. But the cellar spider? Arachnid expert Myles Nolan said the idea that they are the most venomous spider in the world is a complete myth — although they do have fangs and venom glands. What little poison they do have is probably only enough to cause an itching sensation, although they are more interested in woodlice than humans. While their jaw and fangs are quite small, Myles said they still need to be “needle sharp to guarantee them their dinner”. He also noted that very potent venom is often the subject of intensive scientific studies, something which Daddy Longlegs have not. “None of them have an actual interest in biting humans; the few bites that do occur are usually the result of a human accidentally putting the spider under stress, for example by lying on it unwittingly, and the spider bites in self defense”. Myles puts the spread of this myth down to how common the spider is. Most people will recognise it, and so assume they “know” about it, despite their only piece of knowledge being a myth.